When I reluctantly moved to Los Angeles at the beginning of this decade, I missed our annual fall apple and berry picking trip so much that I dragged a posse of ex-East Coasters and their small children to the closest orchard (two hours into the desert) to pick apples one hot October Sunday. To put it mildly, apple picking in California is a sad facsimile of the real deal here in New England. The air was heavy, we were sweaty and the only ones enjoying the adventure were the children– they didn’t know any better. Being back in New England, where there really is a fall season and apples taste like, well apples, we recently took advantage of the pick your own trifecta: September peaches, apples and raspberries and visited Bishops Orchards in Guilford, CT.
Once you leave I-95, Bishop’s Orchards satisfies all the requirements for a fine picking experience. First, after a 45 minute trip on the highway, their retail store and hub of all picking information is one right turn and 1 minute from the exit. You can’t get lost and the kids can’t get antsy. 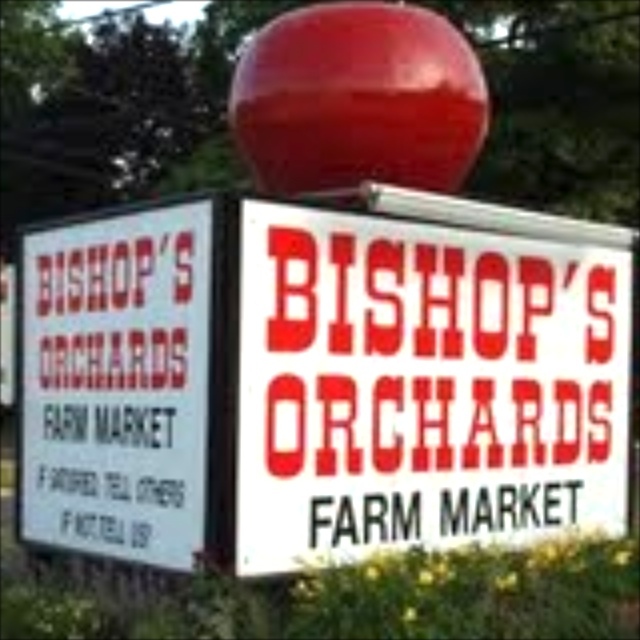 Their large white BISHOP’S ORCHARD sign topped by a giant apple - perfect Americana kitsch - beckons you in. Second, the garden offerings: sunflowers, mums and a variety of perennials and annuals outside the market, as well as the barn housing llamas and goats set a down-on-the-farm tone. The kids had a blast at the barn while we figured out which orchard to start our harvesting. Finally, signs from the store direct you to the pear, apple and peach orchards, about 2 1/2 miles away, or to the raspberry field about ½ mile in the opposite direction. Parking is ample at the base of the orchard, where friendly staffers in an open red barn will greet you, give you as many bags as you’d like, so kids don’t have to share, and direct you to the fruit trees of your choice. We arrived on the early side and never felt like we were competing with other families for the “best” trees - there were plenty of full branches with ripe fruit for all. The apple, peach and pear trees are close enough to each other that it didn’t feel like a schlep – even for the smallest pickers - to go from one to the other and then return to the barn. At the barn, you can consolidate your group’s bounty, return any unneeded bags and pay for your fruit, by the pound ($1/lb. for 20 lbs or more; $1.10 for less; cash only). Driving down the small road to the raspberry patch, you would never know you were only a mile from the highway. We parked next to a pond, complete with lily pads and a turtle; no frogs in sight, and headed toward the perfumed, rubied rows. Here again, the staff was friendly as they handed out buckets tied with enough rope so you could wear them around your neck, if desired, and leave your hands free for optimal berry extracting. Kids should be warned to look for bees that are generally more interested in the flowers, but will occasionally rest on the fruit itself. Raspberry bushes are prickly, so while younger pickers can take the outliers, you can and should reach in where the real gems are growing, hidden under leaves. As more people joined the ranks, the staff opened up additional rows and at times we had an entire row to ourselves. When you’ve eaten your fill right off the bushes or your children are sufficiently covered in juice, the staff at the checkout cart will transfer the berries from your bucket into a small wooden box, lined with a paper towel, and weigh them ($3.29 for more than 8 pounds; $3.49/lb. for less than 8 pounds - cash only). If you are so motivated (I was not) to make your own preserves, you can purchase all the necessary jars, tools and pectin at the checkout cart. After all the outdoor foraging, I wasn’t looking forward to the trip I needed to make to the grocery store, so I could serve more than peach pie for dinner. I procrastinated by following my nose into Bishop’s retail store, where in addition to the expected line up of fruit pies and doughnuts, I was delighted to find a full on market complete with meat, dairy, cheese, produce and snack sections. I was able to do all my marketing and found some excellent specialty items like D’Artagnan Organic chicken, turkey, duck leg confit and Buffalo meat, as well as Plugra butter. On a whim, I picked up some of Bishop’s Vegetable Chips, which were so thick, crisp, perfectly salted, thankfully not greasy and addictingly good; we had to throw them in the “way back” of the car to keep from eating the entire container on the drive home. Bishop’s Orchards grows a variety of apples which are ripe at different times throughout the fall. Check their website: www.bishopsorchards.com for current availability and for up to the minute information on peaches and raspberries, call their 24 hour picking hotline: 203.458.PICK. After washing your fruit immediately when you return home, lay it out in a single layer to dry completely. Place a single layer of raspberries or peaches, which need to be sliced, on a cookie sheet and freeze over night; place in a covered storage container to use in smoothies or baked desserts as needed. According to Harold McGee in a recent NYT article (9-2-09), berries can also be given a hot bath – thermotherapy – (I’m not kidding) in 125 degree water for 30 seconds and then laid out to dry. This will discourage mold growth and keep your refrigerated berries fresher longer. I have never preserved berries, but I have preserved clothes with this tip: If your child’s clothes are “juiced”, boil a large pot of water and throw them in. Stir with a wooden spoon for about 30 seconds or so and the stains will disappear before your eyes.